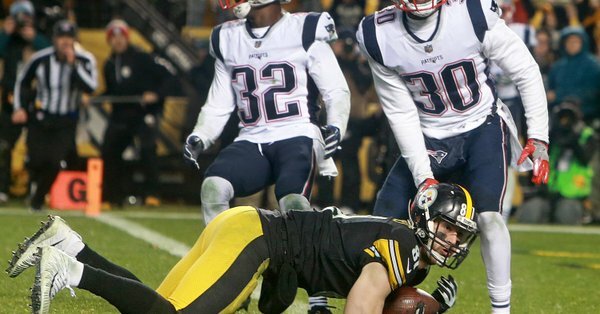 Sunday’s overturned touchdown reception by Jesse James at the end of the Steelers-Patriots tilt cast the latest negative spotlight on the catch rule. Steelers coach Mike Tomlin, a member of the NFL’s competition committee, said Tuesday the catch rule should be looked at this offseason, Kevin Patra of NFL.com reports. Steelers coach Mike Tomlin, a member of the NFL’s competition committee, said Tuesday the catch rule should be looked at this offseason. Tomlin added that he doesn’t know what, if any, a possible change to the rule could look like next season. Dating back to the Burt Emanuel non-reception in the 1999 NFC Championship game, the NFL has tweaked the rule. For all those attempts, the league has gained no clarity into what constitutes a completed catch. Calvin Johnson’s overturned TD in 2010, the Dez Bryant’s wiped away play in the 2014 playoffs, Sunday’s ruling and myriad other instances have left most players, coaches and fans scratching their heads in frustration. The only consistency with the rule is the degree to which it confounds spectators and athletes alike. Be the first to comment on "Tomlin Says No Doubt Catch Rule Needs to Be Closely Looked at This Offseason"